Who invented Scissors? The name of a specific person has never been credited with the invention of Scissors but the first such device, consisting of a pair blades, pivot (fulcrum) and a handle, was made of bronze and believed to have been invented by the Ancient Mesopotamians c.2700–2300 BC. Evolution of Scissors: As time passed knowledge of the handy device spread to other civilizations such as the Ancient Egyptians, the Persians, the Chinese, the Romans and the Greeks. These ancient civilizations developed scissors into a more expensive and sophisticated device, many using expensive metals with highly ornate engravings to suit the wealthiest of their citizens. Definition of Scissors: Scissors are defined as a small, handheld, cutting tool consisting of two cutting blades with finger opening handles, movable on a pin in the center, by which they are held together. The cutting force of the scissors works on the law of lever which allows the rigid body free to turn about a fixed pivot called a fulcrum. The word 'scissors' derives from the Latin word 'cisoria' meaning "cutting instrument". Fact 1: Who invented Scissors? The name of the inventor of Scissors is unknown but it is believed to have been invented in c. 3000 BC in Mesopotamia. Fact 2: Who invented Scissors? Prior to the invention of Scissors in c. 3000 BC, only clumsy knives were available to cut delicate materials such as human hair, linen, finely cloven cloth and thread. Fact 3: Who invented Scissors? The Bronze Age civilizations of ancient Mesopotamia, that included the Sumerians (3000-2000 B.C. ), the Babylonians (1894–1595 B.C. ), the Assyrians (1380–612 B.C. ), and the Persians (550–330 B.C. ), developed impressive skills for fashioning clothing and the addition of fringes was the most important decorative adornment. Fact 4: Who invented Scissors? Working with delicate materials and elaborate fringe making required a tool that allowed more precision than the single bladed knife. They developed a shearing instrument with a pair of sharpened metal blades that slid against each other and invented the scissors. Fact 5: Who invented Scissors? The first Mesopotamian scissors were made of two bronze blades which were connected at the finger opening handles with a thin, flexible strip of curved bronze that acted as a spring. 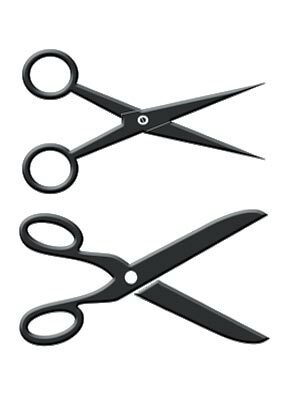 Cheaper pairs of scissors were made from iron. Fact 6: Who invented Scissors? The new, useful tool spread to other civilizations such as the Ancient Egyptians, the Persians, the Chinese, the Greeks and the Romans. Fact 7: Who invented Scissors? The ancient civilizations developed scissors into a more expensive and sophisticated tool, many using expensive metals, with highly ornate engravings and precious gems to suit the wealthiest of their citizens. The scissor blades were pivoted at a point between the tips and the handles. Fact 8: Who invented Scissors? Scissors made of gold, with a handle cast in the form of an animal, have been found in the tombs of Ancient Egyptians. These awesome tools formed part of the essential grooming accessories including decorative combs, mirrors and hairbrushes. Ready dressed wigs were worn by wealthy Ancient Egyptians of both sexes which were elaborately cut and curled to be worn on special occasions and at religious ceremonies. Fact 9: Who invented Scissors? The Romans adapted the scissor to improve the cutting to suit their requirements. The tool was adapted to produce a form of U-shaped handled shears, with two blades and a common metal loop, called a 'Forfex' for shearing sheep. They were also used for cutting hair and occasionally as surgical instruments. These Roman implements were cross blades that pivoted at a point between the tip and the handles, similar to those still used today. Fact 10: Who invented Scissors? The Ancient Chinese developed scissors c. 3000 BC but they became particularly useful for cutting a new delicate material when Paper was invented c. 100 BC. Apart from the usual uses of the tool, the Chinese invented Kirigami, a variation of origami, that includes the cutting of paper. Fact 11: Who invented Scissors? From 300AD to the 1800's ingots of Wootz steel were widely exported and traded throughout the Middle East and the Arab world. Blade makers in the Syrian city of Damascus combined Wootz steel pure metals to make Damascus Steel. The extraordinary Damascus steel blades were famously fashioned into swords but evidence of scissors made with Damascus steel blades have also been found. Fact 12: Who invented Scissors? During the Middle Ages spring scissors were made In Europe by heating a bar of iron or steel, then flattening and shaping its ends into blades on an anvil. The center of the bar was heated, bent to form the spring, then cooled and reheated to make it flexible. Fact 13: Who invented Scissors? During the Renaissance period Leonardo Da Vinci (1452-1519) made detailed sketches of scissors which has led to many people mistakenly crediting this famous inventor and artist with the invention of scissors. This assumption was clearly untrue but it is likely that Leonardo Da Vinci contributed to an improved design. Fact 14: Who invented Scissors? In 1663, during the Ming Dynasty, the Zhang Xiaoquan company in Hangzhou, China, adapted an ancient sword-making technique and began manufacturing its famous scissors with a much harder, sharper edge which are still being sold today. Fact 15: Who invented Scissors? Large-scale, mass production of spring scissors began in 1760, when William Whiteley & Sons of Sheffield, England first used highly durable cast steel to manufacture and popularize pivot-point design. Fact 16: Who invented Scissors? The design of scissors was simplified even further to accommodate mechanized production that was powered by steam. Instead of being forged entirely by hand, steel blades and handles were now formed by using drop hammers. Drop hammers consisted of a heavy weight raised mechanically and allowed to drop, as used in drop-forging and pile driving. Modern versions of drop hammers are still used to manufacture scissors today. Fact 17: Who invented Scissors? Thomas Wilkinson & Son, Manufacturers of Tailors Shears and Scissors, was founded in 1840 and was appointed Manufacturers to her Majesty Queen Victoria by royal warrant and Cutlers (makers of cutlery) to H.R.H. Prince Albert and their products were used at Windsor Castle. Fact 18: Who invented Scissors? Whiteley & Wilkinson were both awarded medals at the Great Exhibition, Crystal Palace in 1862. The firm of Thomas Wilkinson was acquired by the William Whiteley in 1875 and the company is successful to the present day. Fact 19: Who invented Scissors? Pinking shears were first invented and patented in 1893 (patent number US 489406) by American inventor Louise Austin of Whatcom, Washington for pinking cloth, silk, paper, leather, and other materials. Fact 20: Who invented Scissors? A variety of specialized scissors were invented including those used for surgical and medical purposes, Snips for cutting through sheet metal, hair clippers for grooming and various scissor-type tools that are used in gardening and agriculture. Who Invented Scissors? - Unknown Mesopotamian Inventor - Invention - Definition - Meaning - Famous - Device - Innovation - History - Timeline - Significant - Development - Household Items - First - Definition - Kids - Facts - Information - Info - Who invented Scissors - Dates - When - Why - Impact - Purpose - Use - New - Old - Definition - Meaning - Awesome - Cool - Ancient World - Mesopotamia - Scissors History - Scissors Timeline - Who invented Scissors?